Can I upgrade my NVIDIA GeForce GT555M with a later NVIDIA or AMD graphics module? The Razer Blade features a custom GT555M design that is integrated into the motherboard and does not utilize a removable MXM module. Because of this unique design, upgrades are not available. The Windows 7 operating system package includes Microsoft Security essentials. Yes, the Razer Blade features a NVIDIA GT 555M graphics card that supports NVIDIA 3DTV playback. You will be able to watch 3D on an NVIDIA 3D ready display using an HDMI 1.4 certified connection and cable. Does the Razer Blade's Solid State Drive (SSD) support TRIM? 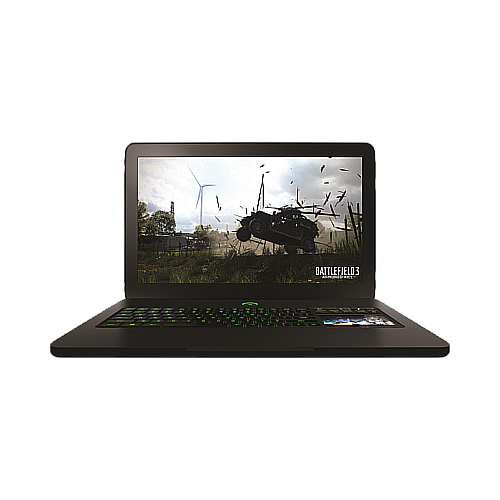 The Razer Blade features two graphics processors (Intel HD graphics and NVIDIA GT555M Graphics). If you would like optimal performance be sure to set your program to utilize the NVIDIA GT555M graphics processor. 1. Right click on your desktop and click "NVIDIA Control Panel". "Most modems have and indicator that shows if it is connected to the internet, check if your modem is connected to the internet. If your modem does indicate that you are connected to the internet, try restarting your modem. If you're still have issues please contact your local internet provider to ensure that the connection is stable. If you still have problems connecting, please contact Razer Blade Technical Support. Why doesn't my Razer Blade come with a Windows 7 OS CD?